This spring there are beautiful greens in season at the farmers market. I love to take a classic salad and make a creative yet enjoyable vegetarian alternative. 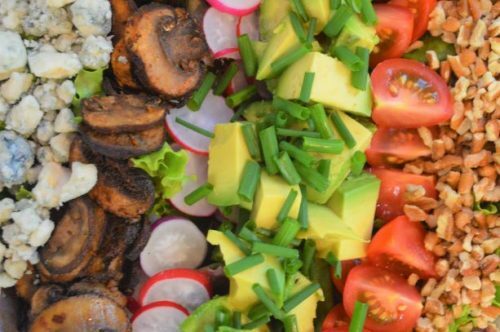 This vegetarian cobb salad does just that and has so much flavor! It’s delicious and satisfying with avocado and pecans. The crispy portobello “bacon” gives it the flavor and texture of oringinal bacon without the weird texture of tofu bacon. I love the combination of blue cheese, chives and sweet cherry tomatoes. 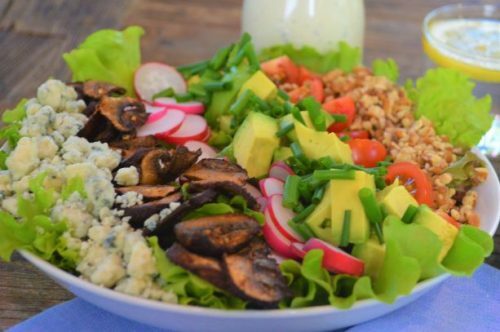 The classic ranch dressing completes the salad and makes it a mouthwatering meal! Mix the sliced portobellos in the olive oil, paprika, and cajun seasoning. Line a baking sheet with parchment paper in and spread the mushrooms out in a single layer. Bake the mushrooms for 20 minutes until they are crisp. Remove them from the oven and set them aside to cool. In a medium bowl, mix the sour cream, buttermilk, mayo and lemon juice. Add the onion powder, chives, dill and salt and pepper. Whisk the mixture until it is combined. Place the bowl in the refridgerator to chill. 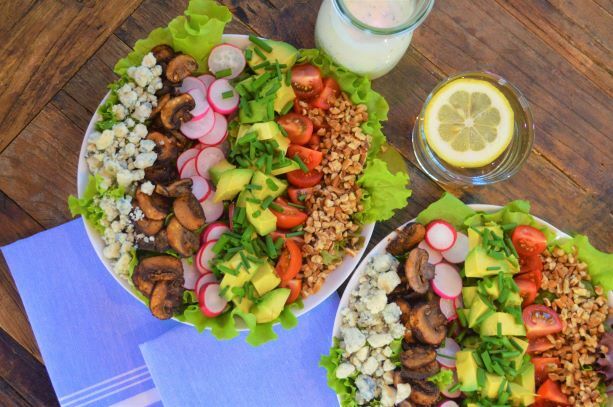 Begin arranging your greens in your salad dishes. Add a row of radish slices. Leave a space and add a row of quartered tomatoes. Add rows of pecans and blue cheese crumbles to the far sides. Top your avocado with fresh chives. Dress with classic ranch and enjoy!